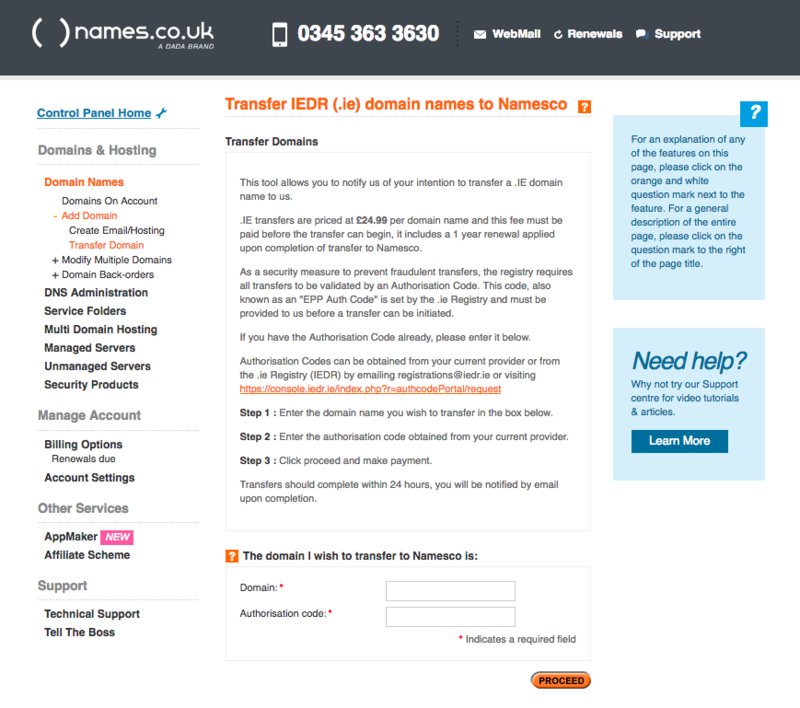 You can transfer domain names in to Namesco from your Online Control Panel. There are different procedures dependent on the suffix of the domain which this guide will walk you through. Now select Add Domain from the left hand menu, which you will see has appeared just below Domain Names. Firstly, list all the .uk domain names you want to transfer in to Namesco in to the box provided on screen, and click on the PROCEED button. 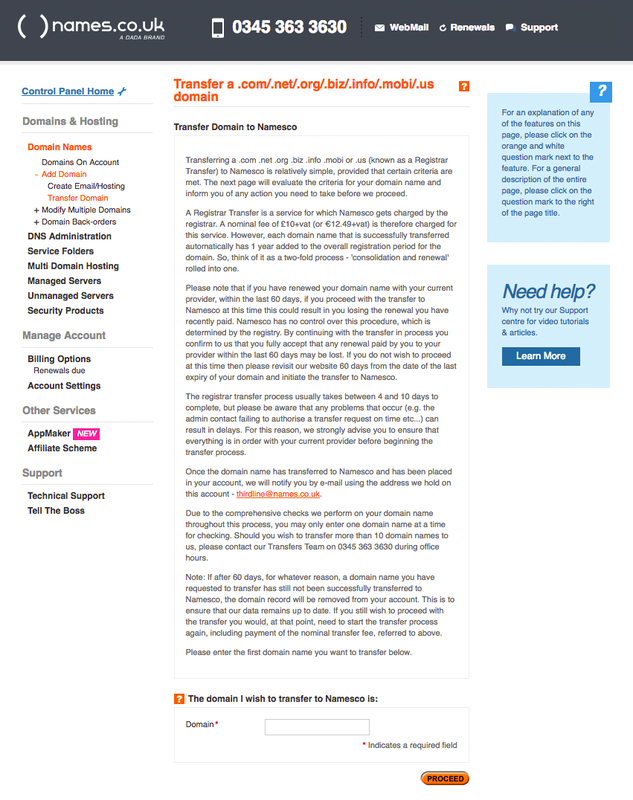 This will then add those domain names to your online account. When Nominet inform us that the IPS Tag has been changed to NAMESCO, our systems will automatically update these domains from Transfer in status to Active. You will then be able to administer them from your online account. Next, after the domains have been added to your account, you need to ask your current registration provider to change the IPS tag on your domain name to NAMESCO - no other information is required. The process to transfer in any of the above domains is different to that of the .uk suffix. Please pay close attention to the text in your Online Control Panel when you begin the transfer in process for .com .net .org. biz .info or .us domains, as there is certain criteria which must be met. 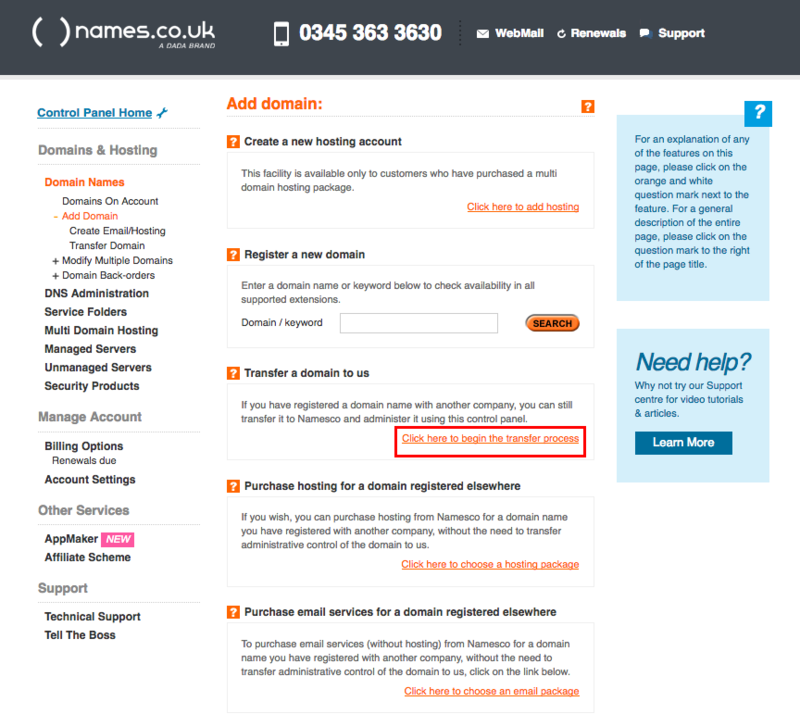 Please also note that there is a charge of £10 +VAT when transferring one of these domains in to Namesco. This charge is levied by the Registrar, however, to compensate for this, we will add 1 year to the overall registration period of the domain. Once you have read and understood all the details on transferring in a .com .net .org .biz .info or .us domain name, then you need to enter the domain name you wish to transfer into the box marked Domain and click on the PROCEED button. This will then take you through to our payment gateway to make the £10 plus VAT transfer payment. Once payment is made, the domain name is added to your online account, with a Transfer in status. When we receive conformation from our registrar that the transfer is complete, this is then changed and the domain name is fully-manageable through your account. 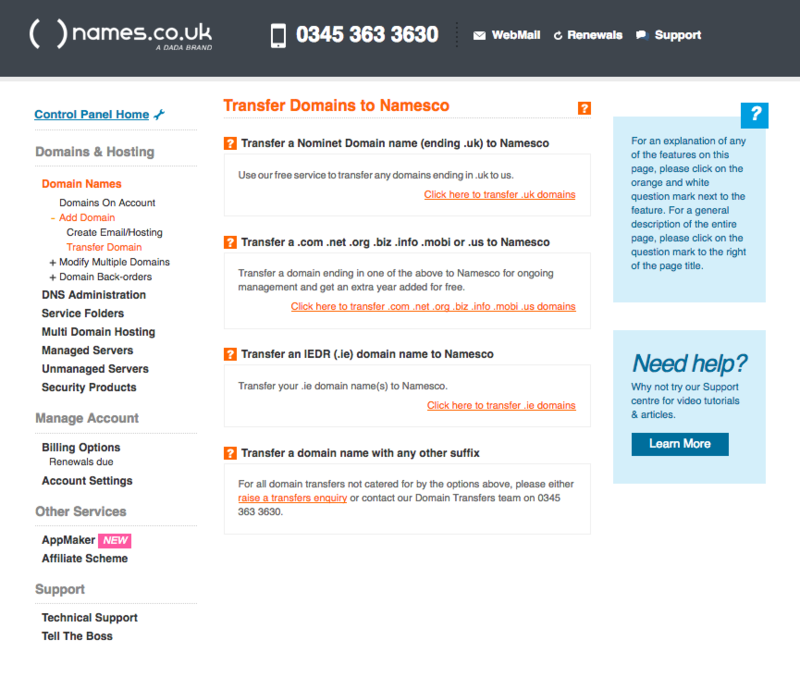 As with Gtld domains, please pay close attention to the text presented in your Online Control Panel when opting to transfer a .ie domain name in to Namesco. Transfers for .ie domain names are charged at £24.99 - This includes the addition of 1 year to the overall registration period of the domain. Once payment is received the transfer window will be opened, please print the authorisation form (one form per domain name) and submit the completed form(s) to us, either by fax (to 1890 943 653 from within Ireland or +44 845 363 3631 from outside Ireland), or by scanning and emailing to documents@register365.com. The form(s) must be signed by the current administrative contact of the domain name(s). Note: Where the registrant of a domain name is a company/organisation, the form should be printed on headed paper. Once you have completed the document and returned it to us, we will validate the request and then submit it to the IE Domain Registry. When the registry has validated and processed the request, the domain name will be added to your account. This information must match that which your current domain registrar holds for the transfer to be a success. 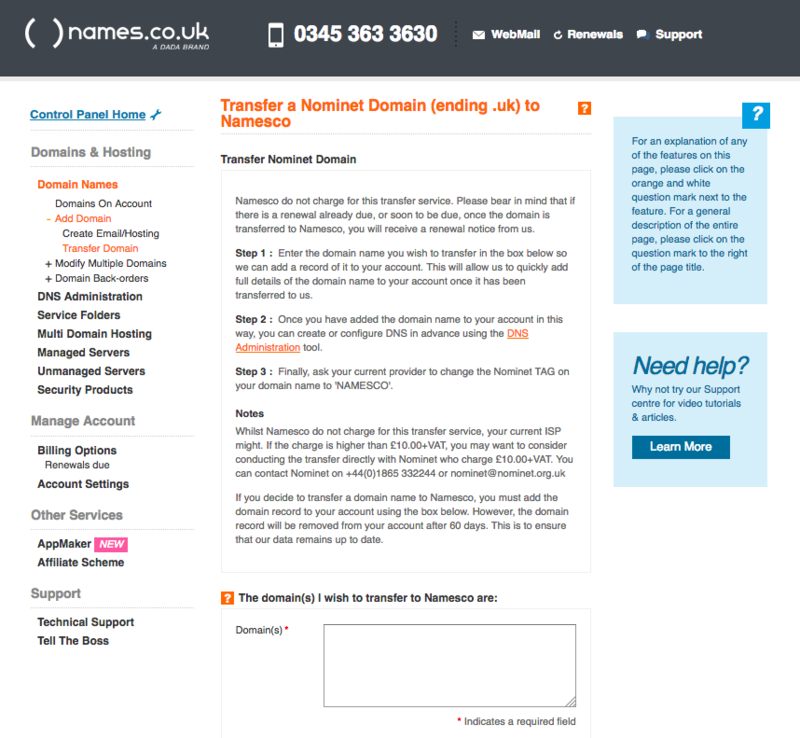 There is a charge of £35 +VAT to transfer an international domain in to Namesco. This charge will be raised on your account by our Domain Administration team upon receipt of the required information above.